Welcome to UH Bristol's Children's Hospital Passport, a document to help children with life-long disabilities when going to hospital. 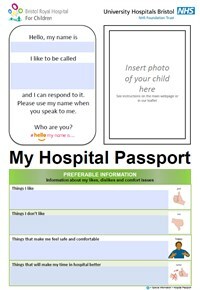 The aim of the Hospital Passport is to provide our staff with information about your child during a hospital visit. This information will help us work in partnership with you in meeting your child's needs when using our hospital services. The Hospital Passport uses a traffic light system. This means that all essential information about your child must be written in the red section, this will alert staff to any extremely important information or specific requirements your child might have. The amber section is for important information about your child's day-to-day activities. Preferable information about your child's like and dislikes can be documented in the green section. Download Acrobat Reader DC which will allow you to tap on the image field and insert a picture - https://get.adobe.com/uk/reader/; for iPad you can download PDFMax5. You should be able to use any other compatible PDF reader which is able to support image fields. Send us a copy of your photo by post (see address below) which we can scan and insert for you. Once you have saved the passport, you can email it to us at childrenshospitalpassport@uhbristol.nhs.uk. If you don't want to use the electronic version, you can print a copy and complete it by hand, and send it to LIAISE, Family Information Room, Bristol Royal Hospital for Children, Upper Maudlin Street, Bristol BS2 8BJ. The team can also offer support if you need help with completing the document; for example, if English is not your first language. Please call them on 0117 342 8065 if you have any questions or concerns about the document or process. Please return your Hospital Passports at least five working days before your child's planned admission date to allow us time to process them. We will try to have the Hospital Passport to hand when your child arrives. However, there may be situations where this is not possible so please let staff know if your child has one and ask for a copy to be printed. If you have a planned stay you may hear from our children's disability specialist, Martyn Wood, to talk about what adjustments we might want to request to help your visit. You can find out more about Martyn and the disability team here. Children under five years of age - review every six months, update if necessary and email the updated copy to us. Children over five years of age - annual review, update if necessary and email the updated copy to us. If you are also a blue badge holder on behalf of your child, we have a permit system to allow you extended time in our drop-off area. When completing your passport, please tick the box make it clear that you are a badge holder. If you are an existing passport holder and have not received a permit but your child is a badge holder, please contact LIAISE on 0117 342 8065.